I am always one for noticing patterns, be it the kind on the print of a skirt or the kind that dictate my daily habits and routines. One pattern over the last few weeks that I have observed is that I am on a floral streak, donning mostly skirts or, in the case of today, a sweatshirt with cheery blooms. Perhaps my floral trend is due to the fact that it is May or perhaps it's due to the fact that I just tend to buy a lot of floral? 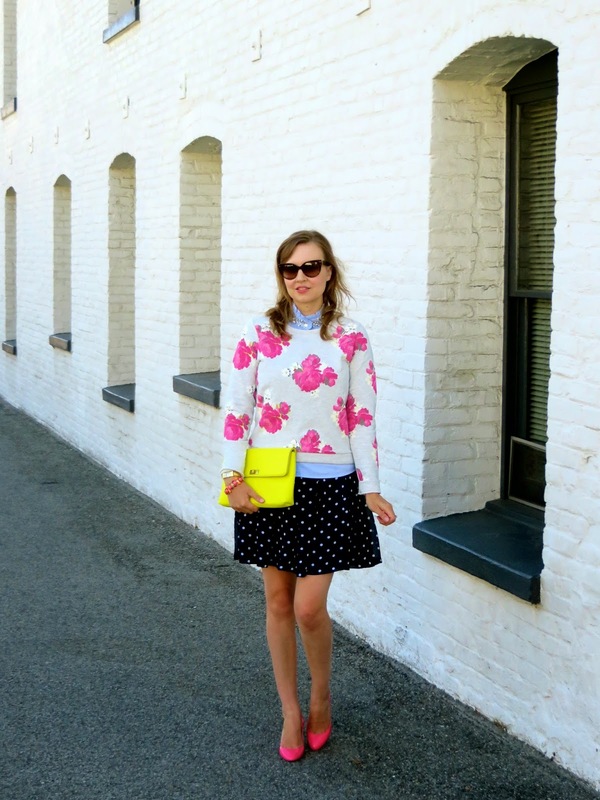 I bought this floral sweatshirt from LOFT last month on clearance for around $15. I saw it on a few other blogs and it met the criteria of being comfy and cute. Plus, I needed something to qualify my most recent order for free shipping. (Never, ever paying for shipping and handling is another one of my patterns!) When the sweatshirt arrived in the mail, I thought it looked a little something like my grandma might wear, so I played up the fun, dare I say youthful, possibilities of the print with a jeweled collar and polka dot skirt and some sweet Christian Louboutin pumps. Truth be told, these shoes kill my feet. Due to this, I had a few blisters before the day was through and this caused me to hobble around a little bit like a Grandma too! This is such a fun look! I love the pattern mix with the pop of yellow! 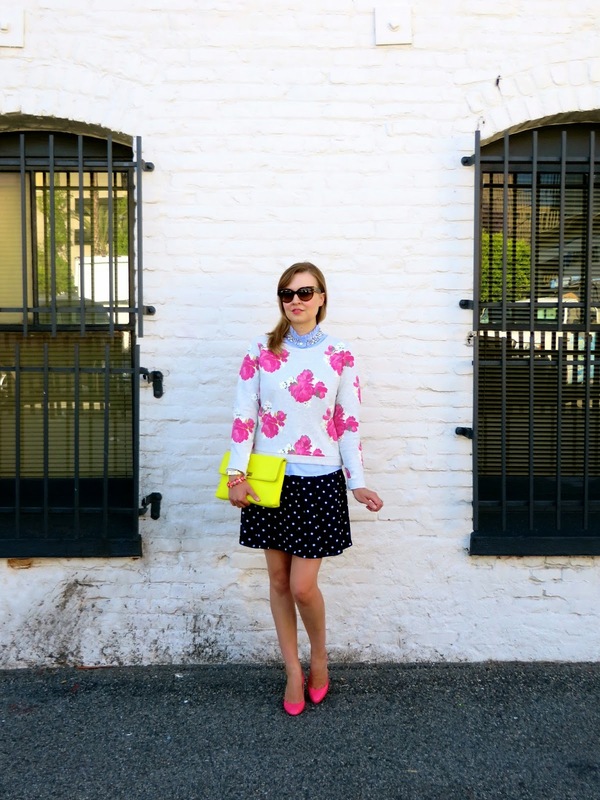 Thanks for linking up with Thursday Fashion Files! Great ensemble!! Love the mix of colors and mix of patterns! I was tempted to buy this but had restraint, Ilove the mix on you and the pink with the pop of yellow! I have the very same sweatshirt (that I also grabbed on clearance) and love it! Love the way your styled it! Oh and I'm so with you on the shipping, I refuse to pay for shipping! I never ever pay for shipping either and will order a throw in. I've learned that I usually end up loving the throw in item and keep it... I think they know this and require minimum purchases. I love the mix of patterns and fun colors in this outfit. 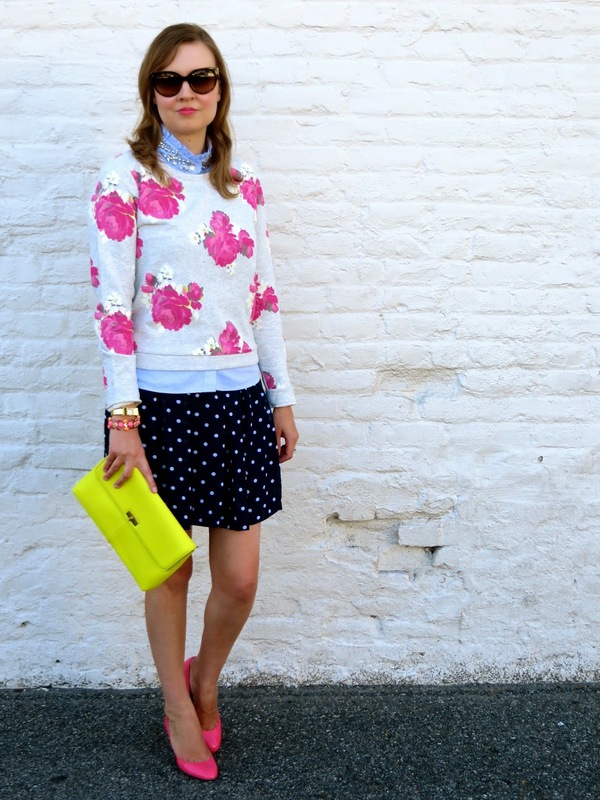 I always love your bright, fun, feminine looks! 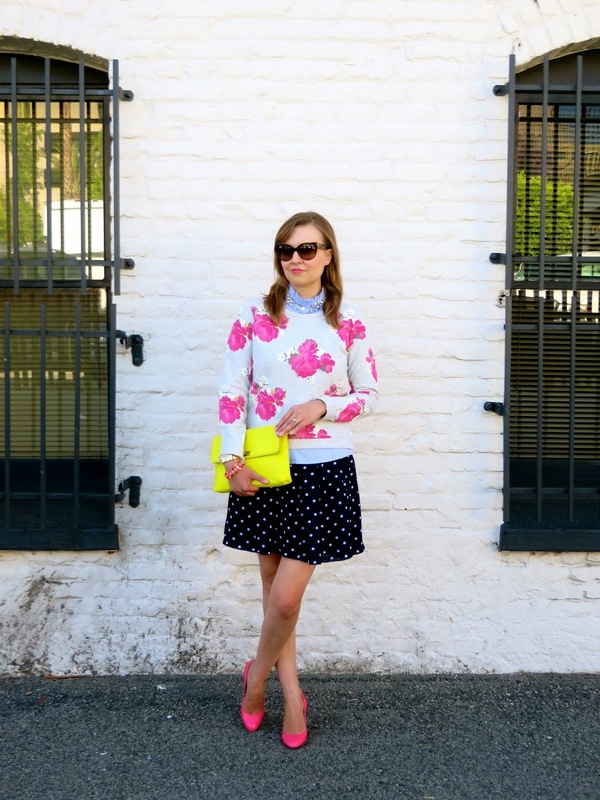 That's an adorable sweater and perfect with the polka dot skirt. Don't you hate when cute shoes hurt? Argh. 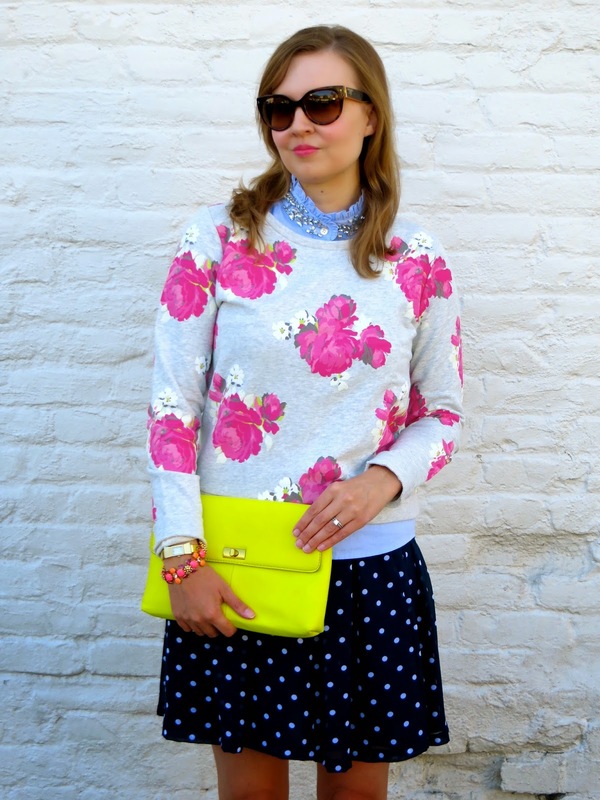 what a pretty spring floral, and stunning neon accessories! Lovely sweatshirt, and I love the layered look. You look stunning. Following you via bloglovin. I love your style. Beautiful textures all in to one- I love it. You look stunning! I would love to have you come by and link up any of your posts with "Bloggers Who Have Inspired Me." This link up goes live every Tuesday and I feature my favorite 5 from the week before each Tuesday.